An explosion and fire broke out at Eckart Effect Pigments, a manufacturer in Painesville, OH. An explosion led to a plant fire at Eckart Effect Pigments, a manufacturer in Painesville, OH, Saturday. 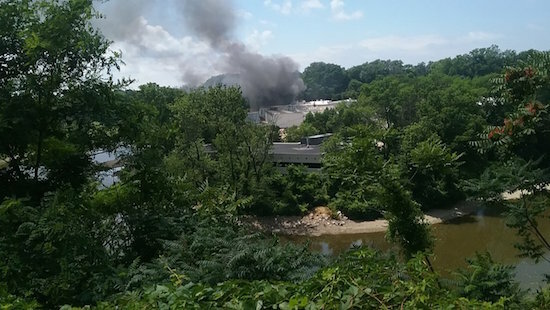 The plant is located on E. Erie Street and workers said the fire started as an explosion around 12:30 p.m. and burned in the warehouse part of the building. ECKART is one of the “leading international manufacturer of metallic and pearlescent pigments for the paints and coatings industry, the printing industry, the plastics, lightweight concrete industries and the cosmetics industry,” according to the company’s website. People who live near the plant said they heard a loud boom Saturday afternoon. Several different Lake County agencies spent hours at the fire scene Saturday, and so did many plant workers who are worried about the future of their jobs. “It’s heartbreaking; it’s really, nothing that really describes the feeling of not knowing if you are going to have work come Monday because of what’s going on right now,” said Chris Allen. Allen has worked at Eckart for about six years. He’s one of the many who stopped near the fire scene to find out what was happening to the plant. “We house a lot of materials in there, aluminum paste which goes into different inks that we make. I was shocked when I got the news so I just decided to take a drive, and see how bad things were,” he said. HazMat crews were on scene, along with multiple agencies.